Dare we say it…spring is here? New England is embracing the temperatures in the high 50s and baking things like this Limoncello (Lemon) Pound Cake! Celebrate spring with me by baking up a loaf today! If you live in the South or in warmer climates, you might think 50F weather is nothing to call home about, but when you’ve had a winter as long as New England has had, it’s time to celebrate. The windows are open, we’re doing some deep spring cleaning – all while soaking in the sun on the deck. 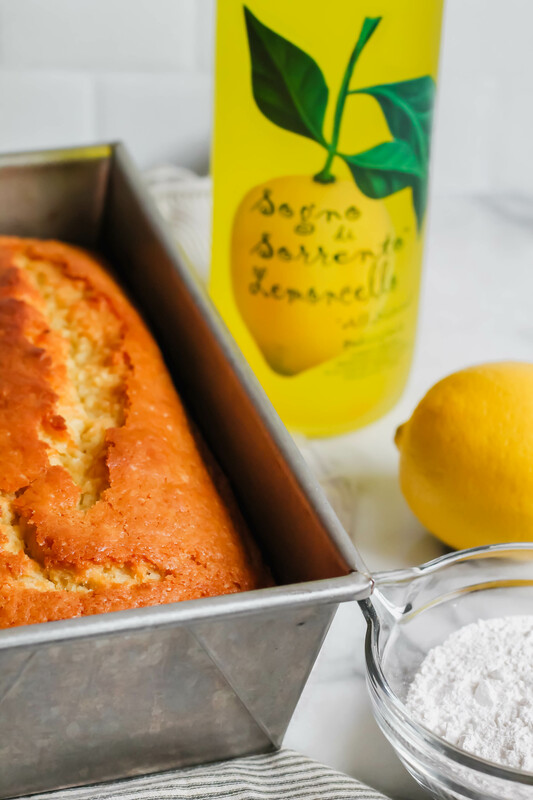 Thus the creation of this Limoncello Pound Cake – it’s like taking a bite of the sun! Traditionally, a pound cake calls for a pound of flour, a pound of butter (yes! ), a pound of sugar and a pound of eggs. I’ve reworked this recipe a bit so it’s – literally – not as heavy as a traditional pound cake but still as luscious. The bring lemon flavor is incredible in this. If you don’t have limoncello, substitute for fresh lemon juice. It’s the perfect cake to have a slice with in the morning with your coffee, in the afternoon as a quick snack, and even before bed as an indulgence with your chamomile tea. The lemon pairs perfectly with it all – although I don’t recommend three full slices a day – but I’m not your Mom, so do what you want! And since it’s spring and even though lemons are a seasonal winter fruit, the brightness in lemons just pair so well with the season of sunshine, so here are a few other of my favorite lemon recipes: Yogurt Lemon Loaf, Lemon Poppyseed No Bake Protein Bites, Lemon Poppyseed Zucchini Bread, and Lemon Madeleines. Whisk together in a bowl all the dry ingredients (flour, baking soda, baking powder, and salt). In a separate bowl, whisk the milk, lemon juice and zest, limoncello, sugar, eggs, and oil. Pour wet ingredients into dry and fold until incorporated. Pour into greased loaf pan and bake 35-50 minutes until done. To make glaze: mix the powdered sugar and limoncello until smooth. Drizzle over warm cake and serve warm or room temperature.